The next time you pull a dandelion up from your yard and are about to toss out what you’re probably used to thinking of as an unsightly weed, think again. You can do your gut a favor by brewing the roots into tea, or treat yourself and your urinary tract to a delicious salad made with the greens. The perennial herb is a diuretic (its French nickname, pis-en-lit, translates loosely to “wet the bed”), high in vitamins A, C, iron and calcium, and has been used medicinally by several cultures for thousands of years. “It is more nutritious than most vegetables that people grow intentionally,” says Jenny Hauf, owner of Muddy River Herbals. Still considered “alternative” by many, medicinal herbs are working their way into the mainstream. It is as easy to find Echinacea, an herb whose leaves, flower and roots are used to fight colds and flu; or gingko biloba, used to treat memory loss, in large drug stores as it is from herbalists. 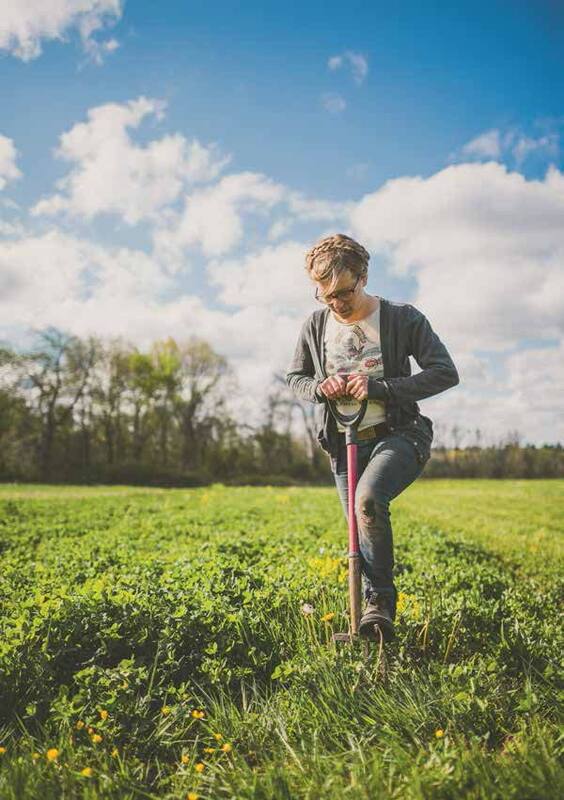 “Interest in herbal medicine is growing in a way that seems sustainable; it’s not just a trend,” says Hauf, who is one of very few farmers in the greater Boston area to specialize in growing these plants. Hauf grows a bounty of flowers and herbs on a roughly quarter-acre plot within the 34-acre Captain John Ogonowski Memorial Preservation Farmland in Dracut. Named for the pilot whose plane crashed into the World Trade Center on 9/11, the Dracut farmland is a parcel that Ogonowski, a fourth-generation farmer, had been working on preserving from residential developers. After he died his family put it into a trust. Hauf, who began growing there in 2015, says there can be as many as five farms at a time in this space, which is also a New Entry Sustainable Farming Project incubator site aimed at helping new farmers get started. Her farm is not certified organic, but she uses organic methods. On a warm, sunny spring afternoon I find Hauf in the field with her apprentice, Maribeth Keane, and Cayla Tepper, a friend she met volunteering on a farm in Italy several years ago. Keane and Tepper harvest dandelions while Hauf walks me through rows of plants. Our visit had been postponed once, due to an early April snowstorm. The snow itself didn’t do too much damage, she explains, but the cold nights and frost that followed hurt plants that were starting to come up. “It’s another good lesson of how you have no idea of what can happen,” says the farmer. A transplanted Midwesterner, Hauf, 31, has been farming for 10 years. When she was growing up in Milwaukee, her father always had “a lovely garden,” as did her grandparents, who lived nearby. A child devoted to Laura Ingalls Wilder’s Little House on the Prairie series, Hauf says, “I was obsessed with the pioneer do-it-yourself lifestyle.” Her route from Wisconsin to Massachusetts meandered through the South, up the East Coast, in and out of the Midwest before crossing the ocean to Europe and back, involving experiences at myriad farms, CSAs and nurseries. Hauf first came East to study writing at the University of Maine in Farmington. After a year, she transferred to the University of Wisconsin in Milwaukee. In 2005, just after Hurricane Katrina, she and a friend traveled through the South, ending up in New Orleans, where they stayed to help a group of people trying bioremediation to clean up contaminated areas. She met a woman there who was heading to a farm in Virginia and went with her. She spent one growing season in Virginia, then returned to Wisconsin. In Milwaukee, Hauf volunteered at Growing Power with Will Allen, “before he was famous,” she says. The nonprofit organization helps provide equal access to safe, good-quality food to people in all communities. It began as an urban farm in Milwaukee offering work experience to community teens and developed into a broader commitment to sustainable food systems. Allen, its CEO and founder, is considered one of the world’s leading practitioners of urban agriculture. Interest in herbal medicine is growing in a way that seems sustainable; it's not just a trend. One of the staffers at Growing Power had worked at a Heifer International farm in Rutland, Massachusetts. Intrigued by the farming opportunity, Hauf decided to go to Massachusetts. She spent nine months at Heifer Farm where, as a bonus, she met Matt Warren, who would become her husband (the two married in June of this year). After leaving Heifer, Hauf and Warren spent eight months in Europe, working on eight different farms in Ireland, France and Italy through World Wide Opportunities on Organic Farms (WWOOF), which allows people to volunteer on participating farms around the world in exchange for room and board. (Full disclosure: my son Luke met the couple on a farm in Italy, where he was also WWOOFing, and they have remained friends.) In the French Alps, they spent six weeks on a medicinal herb farm similar in size to Muddy River Herbals. “You could see Mont Blanc from my window,” Hauf recalls. When they returned to the US, Hauf worked at a vegetable farm in Maine, then apprenticed through the Maine Organic Farmers and Growers Association with noted apple expert John Bunker and his wife Cammy Watts at their orchard and homestead, Super Chilly Farm. She did basic carpentry, harvested apples, created a new garden and helped out with all of the operations of the couple’s Out on a Limb apple CSA, the first of its kind in the country. A friend in Maine at the time, Lauren Cormier, was working toward opening a medicinal herb nursery. “She’s largely responsible for Muddy River Herbals,” Hauf says. “I loved the scale she was doing things.” Bunker also instilled in her “the ethics of permaculture, having plants working together. The way they think about herbs resounded with me,” she says. Once the seeds have germinated, Hauf puts them in the refrigerator for a few weeks or months, “so they think they’ve gone through winter,” she says. Then she places them under grow lights in her basement on a heat mat. “At one point during this cold spring I had about 2,000 plants in the basement from seed to three-foot tall trees,” she says. But the only plants that stay in the basement all winter are aloes. Walking through Hauf’s farm is both an education and a sensory pleasure. There are pretty flowers, plants I’ve always thought of as weeds, some I love to cook with and others I wish I could find more easily for that purpose. 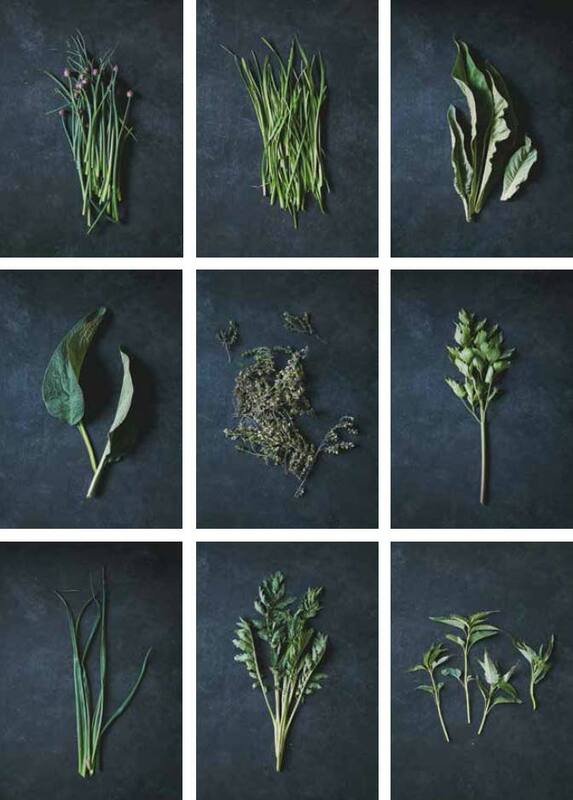 “Almost all herbs have some medicinal use and all of them taste great,” Hauf notes. Mountain mint, with a hot, spicy, mint-like flavor, can treat indigestion, coughs, colds, mouth sores and tooth aches. “A native plant, it has a wonderful relationship with other species that are here,” Hauf explains, particularly bees. Many of the plants in her garden are here for that reason. “You can never have too many pollinators. The more diversity of life on the farm, my soil is healthier, the land is healthier,” she says. Alliums – the onion and garlic family – are believed to be antibacterial and anti-inflammatory, as well as good for the soil “and aesthetics,” Hauf adds. They are planted in late October or early November. “It’s so lovely and hopeful to come and see them coming up [in early spring,]” she notes. Hyssop is good for digestive ailments and bronchial issues. Anise hyssop has gorgeous blue flowers. Marshmallow can treat digestive, respiratory and urinary tract problems. And, of course, make marshmallows. At the end of the growing season, Hauf dries any herbs she hasn’t sold and sells them at the SOWA market. Throughout the season she sells her herbs through a CSA and a variety of outdoor markets. For information on where to find Muddy River Herbals or to sign up for the CSA, go to muddyriverherbals.com.